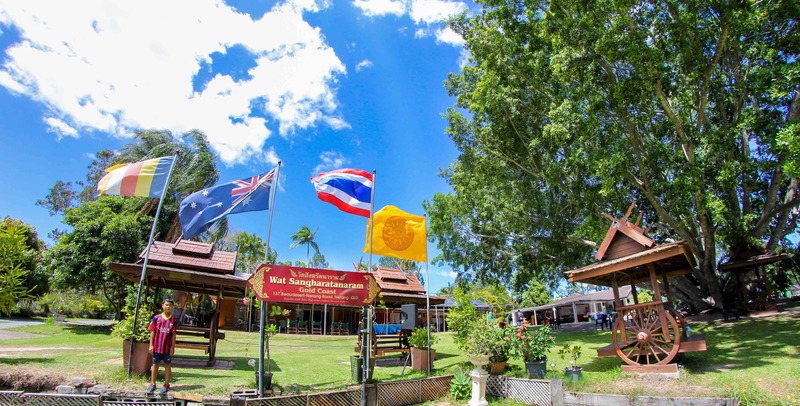 Lesson 1 from Ajahn Pumee | Wat Sangharatanaram Inc.
With great compassion for all beings in the world, the Buddha wished to awaken us to the liberating truths that he discovered. Simply because we do not know the way things truly are, we experience an apparently endless merry-go-round of cycles of re-birth and death, sometimes fortunate, many times unfortunate. There is impermanence, un-satisfactoriness and not-self. These are the characteristics of all existence. There are 4 Noble Truths. There are 5 aggregates or things that are the basis of attachment to one’s body and mind. Setting the right attitude towards meditation practice. What is impermanence? What is un-satisfactoriness? What is not self? OK, so what is impermanence? Ask yourself, “How is it impermanent?” Investigate the nature of this body that we take to be ours. Our body starts out as a cell from our father and mother. It grows into a baby. Then a child, a teenager, an adult. It becomes middle-aged and you notice yourself “Where did all those years go to?” The body continues the gradual change, becomes old and decrepit and eventually dies. The remains breakdown and decay and the elements that made up the body return to the earth. When you investigate like this, wisdom can see that one’s body is quite a source of trouble and difficulty and this is the downside from attaching to it. One’s mind is much more fickle and impermanent, though. One’s mind through thought processes is continually flickering between “I like this”, “neutrality” and “I don’t like this”. It’s too hot. It’s too cold. That’s nice to look at. That’s disgusting. This is too bland. It’s too spicy. This is boring. Wow! This is exciting! That’s nice and clean. What a mess! When you take the time to investigate your mind, recollection can see that something you formerly liked is now rather ordinary. One’s interests change over the passage of time. Things that you formerly knew well, you now only have a vague memory of or you can’t recall anymore. While you meditate and investigate like this, don’t force it, just let it come naturally. The body is a source of much suffering: aches and pains, tooth-aches, headaches, pain on elbows, hands, knees from bumping into something. Feeling hungry and thirsty, or feeling bloated; feeling too hot or feeling too cold. Feeling dizzy. Feeling the call of nature to urinate or defecate. This body is subject to disease of all kinds, lasting for shorter or longer periods of time. Colds and ‘flu, high blood pressure, diabetes. Worn-out hips and knees. Heart disease, cancer of many kinds. Then there are the unfortunate ones with disabilities: blindness, deafness, loss of the use of limbs, hands and immobility. There is also un-satisfactoriness as a companion to diseases of the mind, sadness and depression. The separation from or loss of dear family members and friends. Being stuck in the company of people or things you do not want to be with. The pain of parents or carers in having to look after children or relatives with infirmities, disabilities, autism, drug or alcohol dependency and terminal diseases. Instead of accepting things as they really are, the mind is troubled with thinking, wanting conditions to be otherwise than they really are. We all take this body and mind of ours to be “mine”, it belongs to “me”. “This is what I am.” “This is my self”. This is an assumption that seems to be self-evident and is strongly reinforced by our normal education and social conditioning. The self-view causes us to think in terms of “me and mine” versus “you and yours”; “them” and “us”. Only a Buddha reveals to the world, for those interested to listen, that the concept of a self is NOT real. If this body of mine, if it truly belonged to me, if it was actually in my power to control, then I would be able to say of it, “I want to be like this”, or “I don’t want to be like this”, or “may I live forever”. But, however much we would like our body to be healthy, or stay young and be free of diseases, aches and pains, it just doesn’t listen to us. We might think that we can actually do something about this body by playing around with the conditions supporting life such as eating good food and vitamins, breathing fresh air, taking medicines, proper exercise, and having plenty of sleep. But we are all powerless to prevent the inevitable changes to our bodies, away from being healthy, strong and beautiful. And did you actually have the power to do anything to keep yourself out of harms way and stop that accident happening? The truth of not-self, or being without a true owner, for all beings, things and concepts everywhere in the whole universe, does not come about simply because one reads about it, or hears it from a teacher, but arises when one comes to true wisdom and knowledge. One needs to reflect very often on our own old age, sickness and death as well as separation from that which is loved or we have had the use of. Again, contemplation and meditation such as this can’t be forced. True understanding and knowledge will only arise in its own good time as a result of earnest and correct practice. What are these 4 Noble Truths? The 1st noble truth is suffering: there is un-satisfactoriness. The 2nd noble truth is there is a cause for the arising of suffering. The 3rd noble truth is there is cessation of suffering. The 4th noble truth is there is a way which leads to the cessation of suffering. These are ennobling truths because through the correct and complete comprehension and understanding of them one’s whole being is irrevocably transformed so that greed, anger and delusion no longer arise and as a result one is no longer plagued by having to endure a body in future births along with its sickness, old age, decay and death, as well as mental faculties and their accompanying grief, despair, anguish, separation, pain and suffering. OK, what are the five aggregates or aspects of attachment? They can first be broadly classified as physical form and mental factors. Feeling pleasant, neutral feeling and unpleasant feeling. Memories, labelling, putting names to things; the convention, the terms of language that we use to describe things. Visual objects have colours such as red, light, dark. Or shapes like, round, square, long. Sounds are referred to as soft, loud, high-tone, low tone. Odours are fragrant, odour-less, or foul. Flavours are sweet, salty, bitter, or tasteless. Objects coming into contact with the skin are hot, cold or neither hot nor cold; rough, smooth, or neither rough nor smooth. These are the various thoughts, ideas, and conceptions of mind, the multitudes of trains of thought that we have. When one is awake, there is a basic awareness of contact happening between each sense door and its corresponding sense-object. One is aware that the eye sees form; the ears are hearing sounds; the nose is smelling odours; the tongue is tasting flavours; the body is touching tangible objects; or that the mind is being involved with mental objects.